Land Rover Range Rover Sport 3.6 TDV8 HSE E4. Wonderfully spec'd diesel automatic 4X4 at a great price with leather and wood interior. 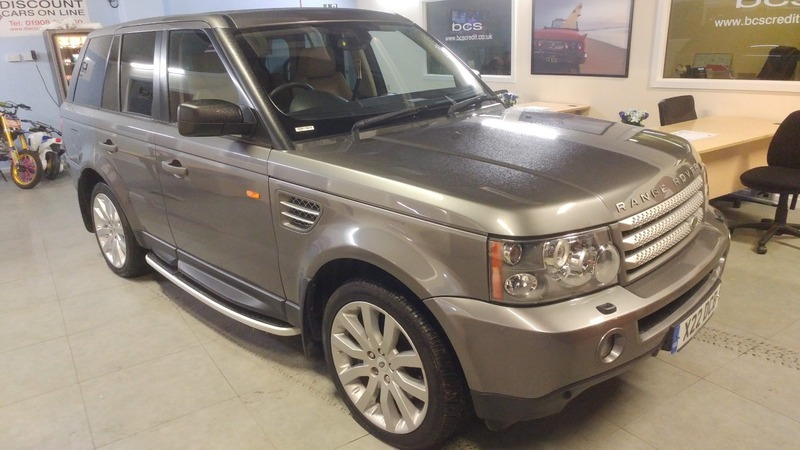 Land Rover Range Rover Sport 3.6 TDV8 HSE E4. Diesel/Automatic finished in Grey. This wonderful 4x4 car has fantastic bodywork and the interior is in really good condition and it drives brilliantly as it has been really well maintained by its previous owners and has done just over 10k miles per year which is fantastic for a diesel 4x4. The performance is great for such a large car with the 3.6 litre diesel engine producing 268BHP which powers the car to 62 MPH in just over 9 seconds. Running costs are competitive for a 4X4 with 25.7 MPG. The car has only had 3 previous owners and has a service history with 7 stamps in the book. This Range Rover Sport has loads of space for all the family plus luggage, looks fantastic in Metallic Grey with privacy glass some massive 19" alloy wheels. Inside the car looks amazing as it has a full cream leather and wood interior and is filled with gadgets such as Bluetooth, Radio/CD player with AUX, USB and iPod connectivity, parking sensors, Sat Nav with 7" screen, daytime running lights, rain sensor windscreen wipers, multi-function steering wheel controls. All of this is offered at a great price which includes BCS's 6 month dealer warranty and 12 month AA complimentary breakdown cover.